When it comes to waste management, there is a hierarchy of approaches to dealing with the waste. Firstly, the best option is to avoid any waste at all – a total lifestyle change is needed, but it is not impossible. Second on the hierarchy is reuse – if you can repurpose glass jars and use plastic containers again, that will cut down your waste significantly. The third most preferred option is to recycle – separating household waste according to their material and having it collected by a recycling company. Aluminium cans (the type that contains your favourite fizzy drink or beer) are 100% recyclable and can be returned to the shelf as a new can in as little as two months after being thrown in the recycling bin. However, don’t forget about your aluminium foil and those disposable aluminium trays used for cooking – simply wipe them clean and rinse them to get rid of any food before recycling them. There is no real limit to how many times aluminium can be recycled. Steel cans (also called tin cans, such as the ones that contain tuna, chopped tomatoes, beans and soup) are also recyclable. Most of our cardboard shipping boxes are made from recycled materials, such as old cardboard products or sawdust and woodchips. Corrugated cardboard can also be recycled to produce cereal boxes, paper towels, tissues and writing paper. Don’t recycle wet cardboard as this can clog the sorting machines at the recycling plant. Similarly, pizza boxes can’t be recycled because of the grease that soaks into the cardboard from the pizza. The same goes for paper plates, napkins and paper towels that have food or grease remnants. 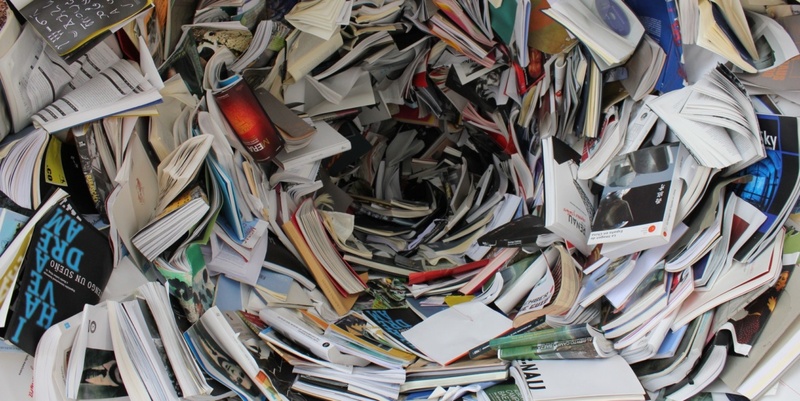 Glossy magazines can, in fact, be recycled. New technology has allowed shiny magazines and brochures to be recycled into newspaper, tissues and writing paper. High-grade, white bond paper used for printing should be recycled separately from other waste paper. This office paper can be turned into stationery such as envelopes, tissue paper and magazines. Low-grade paper such as newsprint, coloured paper and school exercise books can be turned into cardboard, newspaper and toilet paper. Paper juice boxes and milk cartons are harder to recycle, but some South African companies have the technology, called hydro-pulping, to do it. These paper containers are coated with a thin layer of polyethylene plastic to prevent the paper from getting wet. Glass should be separated by colour. Clear glass such as cola bottles, jam jars and condiment containers can be recycled into any colour of glass product as the manufacturers add other chemicals to produce the desired colour. Brown glass, such as beer bottles, can only be used to create other brown glass products. The same goes for green glass – the green cannot be removed and so it can only be used to produce other green glass products, such as wine bottles. Not all glass can be recycled. Heat-resistant glass such as Pyrex dishes, as well as glass ceramics, should not be put in the recycling bin. Broken mirrors and crystal glasses also cannot be recycled. It is important to first rinse and remove food from any glass containers before throwing them away. Light bulbs can be recycled but must be separated from other glass-only waste, as they obviously contain metal elements. Like glass, it is very important to rinse and clean plastic before recycling it. Food contaminants and grease can spoil an entire bale of plastic recycling. Plastic comes in many different forms and chemical compounds, each of which needs to be recycled in a different way. On plastic products, those little triangular icons with numbers inside them tell you what type of resin was used to produce the plastic. These symbols do not mean that the plastic can be recycled, so the best way to tell if you can recycle the container is to go by shape; bottles, jugs and jars are the most readily accepted waste for recycling. Plastic bottle caps can also be recycled. Grocery packets and produce bags, like potato and onion plastic sacks, should not be placed in recycling containers, or have recycling placed inside them. The bags can get wrapped in the machinery and shut down entire recycling factories. They also have a tendency to blow away in the wind, and end up in rivers and oceans. Instead, plastic bags should be reused, or placed in disposal containers of their own. Household batteries such as AA, AAA, or button batteries (watch batteries) should be recycled separately from other metal products. The chemicals inside batteries need to be managed and treated properly. Similarly, car batteries can be recycled too, but because they contain plastic, acid and lead, they need to be processed in special treatment factories. Many garages and service stations can take your old car batteries and have them recycled on your behalf. Car batteries can produce fertilizers, dyes and other battery products. Rechargeable batteries used in laptops, cellphones and cordless power tools can be recycled to reclaim the precious metals and dispose of harmful chemicals correctly. Granted, space is an issue when it comes to recycling in the home; not everyone has space for all the different bins. Ice cream containers and plastic tubs make great little recycling bins in small apartments, but for larger waste items, outdoor wheelie bins work the best. If you have the space in your kitchen or outside, set up about seven bins (one for each of the main categories above, plus one for compost and one for general/miscellaneous waste). Getting your children to start recycling from a young age will be helpful, and can be turned into a fun game too. It is also important to find out what recycling facilities are available in your municipality – some smaller towns and municipalities do not have the necessary facilities to recycle all the waste products, so establishing what they can recycle will save you the effort of separating everything.